It’s that time of year again, and X Dog Events never disappoints with their epic adventure races. The 2018 Mt. Hood Scramble will held on June 17th this year and it will be memorable as always. “The Grandfather of Filth” is a fitting nickname for this event, as there’s no way you’ll get out of this without getting a little dirty. Don’t wear clothes that you don’t want potentially ruined. This race, which is “about” 6 miles long, has been around for over 20 years, so accept no obstacle race substitute! There are a lot of others out there, but this is the REAL DEAL, with hills and creeks to maneuver, along with heavy brush, rocks, mud, dirt, and lots of sweat and maybe some blood too. Obstacles aren’t created for this event, they are found. I’ve done a few X Dog events myself and I have always walked away dirty, bruised, and beat up but happy. 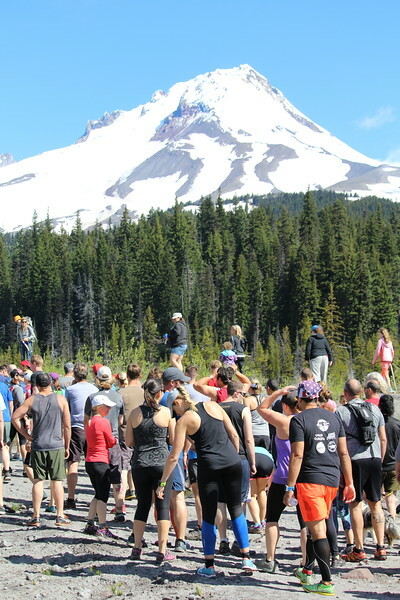 This is not your typical race, so don’t plan for any aid stations. Bring your own hydration and nutrition. It will be timed and there will be some awards and random prize giveaways afterward, along with some watermelon and beer. The celebration at the end is well worth what you’ll put your body through to get there. You’ll find this race at the White River West Snow Park which is off Hwy 35 near Mt Hood Meadows. Race check-in will begin at 8:30AM on race day. This race will be challenging, but even with mud in your eye, you will walk away smiling, as this is a super fun adventure!! Come camp out with your fellow runners before the race, after, or both. If you want more info on that, email: xdogaaron@gmail.com. There is a cap at 400 runners, so register now so you can be one of them! These events fill up quickly so do it!